The candyman can ’cause he mixes it with love and makes the world taste good." When local school children crave a hand full of gum drops and a pint of whiskey, where can they go? Rumor has it that if they visit Frank Belioiâ€™s candy store at 5973 South Broadway, they may leave with a few new cavities and a major buzz. Sgt. 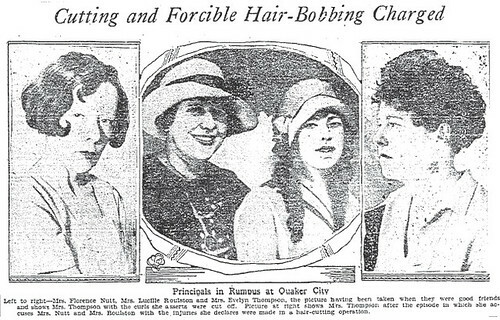 Childers was in charge of the squad that raided the local sweets shop, and revealed in court that although the police department had reports that Frank was selling liquor to minors, they had failed to produce evidence against him. Frank was lucky â€“ the only thing the cops managed to bust him for was the one and one-half gallons of whiskey on the premises. He said he kept it on hand for party guests. 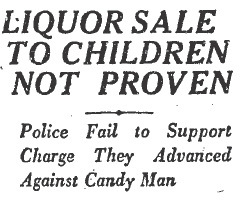 Frank pleaded guilty to the possession charge, and Judge Ambrose fined the candy man $300 [$3,639.31 current USD]. I could go for a pint of gin and a chocolate bar right about now. Are you with me? A police dragnet is closing in on the killers of Luther H. Green. 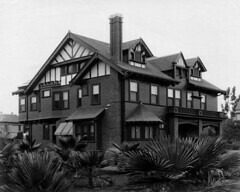 A member of the Los Angeles Stock Exchange, Green was slain outside of his home at 1053 Bonnie Brae, as he attempted to thwart the hijacking of his $10,000 [$120,710.34 current dollars] stash of pre-prohibition booze. He was able to fire a single shot from his rifle before being mortally wounded by the burglers. According to Chief of Detectives Cline, six men have been implicated in the aborted liquor heist. 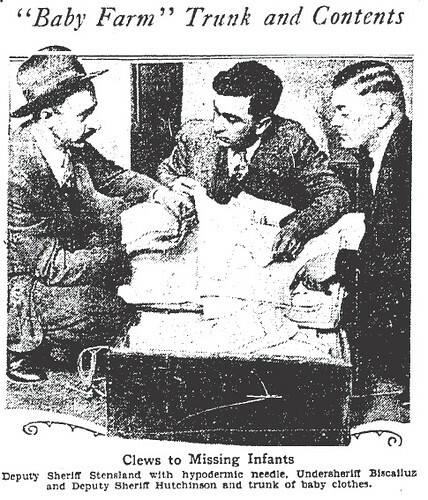 It is believed that the ringleader of the failed raid may be the notorious crook, Harry “Mile-Away” Thomas. 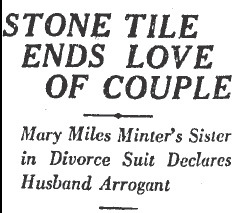 Mile-Away’s mouthpiece, Attorney S.S. Hahn, told cops that he had conferred with his client and, “…he was not only a mile away this time, but sixteen miles away”. 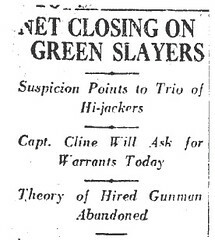 Harry and several of his confederates would soon be arrested in connection with Green’s murder, but none of them would ever stand trial for the crime. More than a decade prior to the invention of Teflon ®, the often busted but rarely convicted non-stick felon would be released on the charges stemming from the Green killing. 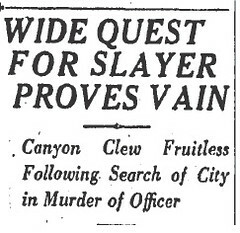 His lucky streak would end on the evening of April 21, 1927. Harry would be caught in a sting and gunned down by the law as he attempted to steal an expensive automobile from a private garage at 1408 West Thirty-Fifth Street. Edward W. Xanders (aka Bert Best) was extradited from Portland, Oregon today to be tried for a series of robberies and burglaries committed in Los Angeles over the Christmas holidays. Xanders spent most of the day with sheriffs, trading quips and calmly confessing to a litany of misdeeds. He admitted to burglarizing the home of John Lindley near Azusa (see photo), and he has also said that he and his crime buddy, Ray E. McCoy, robbed famed boxing manager Jack Kearns. It was through his confession that police learned that Xanders and McCoy had stopped Kearns’ car on a lonely road near the beach. While the stick-up was in progress, a policeman had approached the car to see if the men needed assistance. McCoy jabbed a gun into Kearns’ ribs and told him to keep quiet, or die. Always the glib talker, Xanders chatted with the cop, offered him a cigar, and sent him on his way. 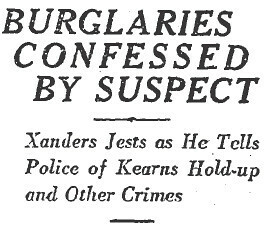 Xanders admitted to police that he had been in court a few times during 1926. He stated that he had been granted probation on a charge of assault with a deadly weapon. It was during that case that he had told the court that a childhood head injury had led him to a life of crime. According to his story, ever since he had received the blow to his noggin, he has had an irresistible urge to commit crime. Based on an alienist’s report, the judge recommended that Xanders, if willing, should undergo an operation to relieve pressure on his brain. Xanders declined to have the surgery. With the nasty pressure still on his brain, it wasn’t long before Xanders was in court again. In making his plea for probation, he said that he’d been offered employment for two years on a ship headed for the South Seas. The judge felt compassion for the youthful crook and gave him four years of probation, on the condition that he would accept the job and sail off into the sunset (and out of this jurisdiction) for at least two years. Of course Edward never boarded the ship; he stayed in Los Angeles and continued his crime spree. Edward is still a young man, and his penchant for crime may easily lead to another crack on the cranium. Maybe a second smack upside the head will put him on the straight and narrow. Hut, two, three, four – an army of field mice is on the march in Taft, and like most armies, this one travels on its stomach. Despite being low on the food chain, or maybe because of it, field mice are crafty little creatures, and they can rapidly assess a situation before taking action. While cutting a wide swath through Taft, the mouse invaders spied a small sheep that was confined in a pen and unable to escape. Hundreds of rodent soldiers felt their mousedar vibrate. They swarmed the helpless animal and devoured it on the spot. Not all mice are evil sheep snacking marauders. On November 18, 1928, Walt Disney would introduce an adorable animated anthropomorphic mouse in the cartoon, “Steamboat Willie”. Nobody would ever look at a mouse in quite the same way. Bending the Volstead Act to the breaking point is de rigeur among the smart set, with an evening of drinking rarely resulting in anything worse than a queasy stomach and a screaming headache the next day. Dennis J. Cavanaugh (22) and his companions Walter Scott and “Tex” Scott went out last night to do a little carousing. The young men began their evening by stopping off to buy a couple of pints of rum at a store on East Ninety-Second Street, run by the Henkins brothers, Clay (46) and William (48). Where the young men went to party after purchasing the hooch is not known, but by this morning Walter was in critical condition at his home, “Tex” was very ill, and Dennis had been found dead on the front lawn of a house at 1847 Roosevelt Street – his body reeking of alcohol. 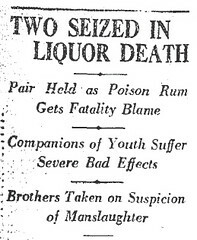 Whether they knew it or not, the Henkins brothers had sold the boys poison liquor. They are currently in jail facing manslaughter charges. Buying illegal booze is dangerous – it’s like playing Russian roulette. But it becomes even more frightening when people like Wayne B. Wheeler, advocate of the Anti-Saloon League, come out in support of allowing the government to use poison to enforce Prohibition. On January 1st of this year, the new government formula (“Formula No. 5”) for denaturing industrial ethyl alcohol went into effect. The formula doubles the amount of poison which manufacturers are required to use. Bootleggers sometimes buy industrial ethyl alcohol and substitute the original label with one of their own. Only three drinks of the libation may cause permanent blindness. Many in Congress have demanded that the government stop legalized murder. The Secretary of the Treasury recently announced that he is opposed to the use of poison to enforce the law, but that “Formula No. 5” will remain until a non-removable, non-poisonous denaturant can be found by government chemists.